Recommended to: Readers who are looking for an action packed adventure! Especially those who enjoy a historical background in their reading. Just when they thought they were safe, Amber, Trendon, and their classmates get yanked back into the action. With the Tebah Stick in enemy hands, Amber becomes a target, and it seems even her closest allies can't be trusted. Now the gang will have to travel through enemy territory to protect a deadly ancient weapon that could cause the earth's utter destruction. The Guardians are back, and this installment things get even more heated than before! We join Amber and Trendon as they are working on getting back into their normal lives. After being secreted half way across the world to help uncover an ancient artifact, who could just go back to school? I loved that both of these characters are back in this book. Amber is just as sweet and stubborn as ever. Trendon? Well, he's Trendon. Hacker extraordinaire and just a bit on the eccentric side. Both fabulous characters! 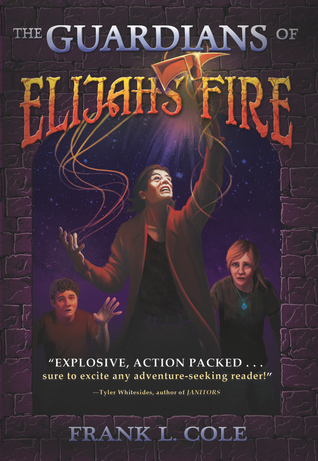 What really impressed me about The Guardians of Elijah's Fire was how quickly the plot really took off. In the first book, Frank L. Cole had to lay down a lot of back story to make things flow. In this book Amber and Trendon are thrown into the action almost instantly. This is a story that will grab you by the shoulders and drag you in. There is not a moment of rest for these characters! If you are a reader who enjoys intrigue, deception, and some historical background in your reading, welcome to your new favorite book. I remember, back when I reviewed the first book, Cole was telling me how he hoped these books appealed to all reading levels rather than just one. In all honesty? This is a book that I know will draw from all reading levels. It has a little bit of something for everyone. As an adult reader, I found myself completely lost in the story. I'm sure younger readers will be too. One slight warning though. Since this is an action packed book, there is violence. Explosions, deaths, and the like. Nothing over the top, but take that into account when choosing this for your young reader. 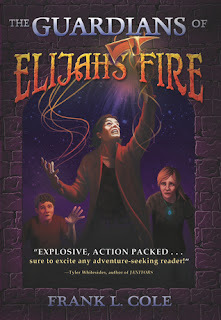 Overall, I have to say that I completely adored The Guardians of Elijah's Fire. I did miss the relationship between Amber, Trendon and Dorothy, but in this book it's important that it's a little bit different. Nope, no spoilers here. You'll have to see for yourself. Let's just say that you should read this. If you are a fan of action, if you enjoy seeing young characters pitted against near impossible odds, then this is a story for you! Get out there and get a copy. You won't regret it.